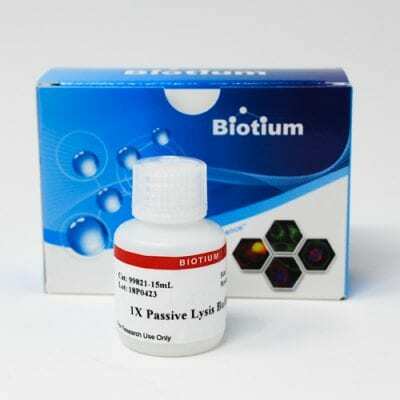 1X Passive Lysis Buffer 2.0 is a cell lysis buffer that is designed for use with Biotium’s Firefly & Renilla Luciferase Single Tube Assay Kits (catalog no. 30081). Those kits are supplied with sufficient lysis buffer to perform the stated number of assays with cells grown in 96 – 24 well plates. 1X Passive Lysis Buffer 2.0 is sold separately for use with the kits when more lysis buffer (e.g. >100 uL/well) is required. The buffer also can be used to dilute recombinant firefly or Renilla luciferase enzymes without the need to add BSA to stabilize the enzymes. Note: If additional lysis buffer is required for the Firefly Luciferase Assay Kit 2.0 (catalog no. 30085) or the Firefly Luciferase Assay (Lyophilized) (catalog no. 30075), purchase 5X Firefly Lysis Buffer, catalog no. 99923. If additional lysis buffer is required for Renilla Luciferase Assay Kit 2.0 (catalog no. 30082), purchase 5X Passive Lysis Buffer, catalog no. 99912.